Select from the categories below to find programs and resources for children ages 7 to 12. From resources on happiness and well-being to programs supporting individuals with mental illness find a wide range of information on mental health and wellness. Find programs on addictions and substance use which are available in Abbotsford. From food to health find programs and resources available to help meet your basic needs. Programs to support your cultural and spiritual well-being. Programs available to assist individuals with developmental and / or physical challenges as well as support for their families. View education and training opportunities that allow you to build upon your abilities and expand your skill-set. From Foster Parent Support to Counselling and Grief Services there are a wide range of programs for families with children 7 to 12 in Abbotsford. View the list of programs and resources available to support LGBTQ2S+ children. From a mentoring program to sports, cooking and arts view the wide range of activities available for children 7 to 12 in Abbotsford. From bullying and online safety to sexual exploitation and child protection services find out about programs and resources on these tougher but important topics. 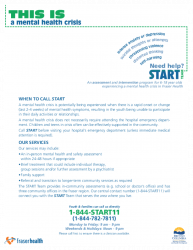 If you need help with a child having a mental health crisis connect with the START team. START stands for Short Term, Assessment, Response, Treatment - they provide assessment and intervention services for 6 to 18 years olds. *Please call first so they can ensure there is a clinician available. To find out more including information about their services download the PDF. The information; the links and content on this website are not under the control of the Abbotsford Child and Youth Committee. The content on this website is provided only for informational purposes. The ACYC has no control over the nature, content and availability of the sites this website links to. The inclusion of any links does not necessarily imply a recommendation or endorse the views expressed within them. The content on this website is not medical advice. The Abbotsford Child and Youth Committee bears no responsibility for the accuracy, legality or content of the external site or for that of subsequent links. Copyright 2019 Abbotsford Child & Youth Committee. All Rights Reserved. | Web Design By Triple I Web Solutions.